This blog is part of the health in urban development blog series – the full series can be found at the bottom of this post. Urban transport and mobility are critical instruments for development, health and sustainability. Transport is one of the most data-, land- and resources-intensive sectors in urban public policy, consuming often more than a third of public budgets in Global south cities and being explicitly linked with many of the UN’s Sustainable Development Goals. However, conventional transport planning lacks sufficient tools, policies and methods that make explicit the links between transport, liveable and sustainable cities, and health. 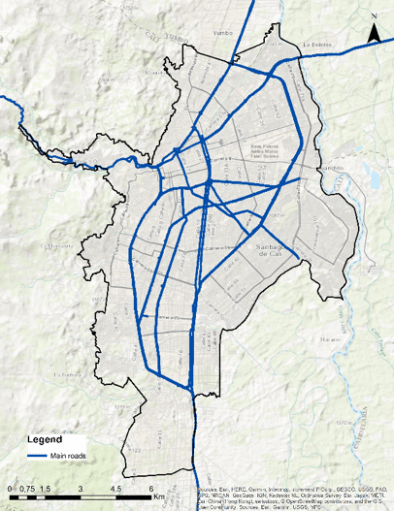 This blog showcases a participatory methodology for drawing a baseline and developing future impact assessment on liveability and the social determinants of health in transport-driven large-scale urban interventions. 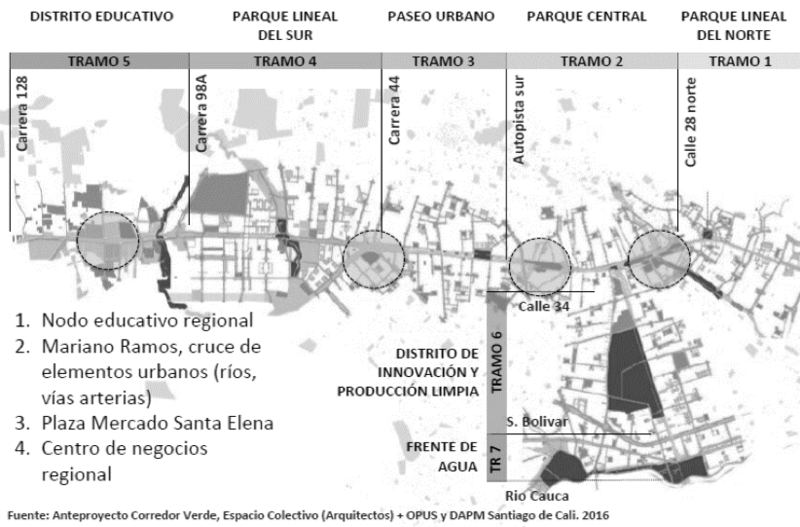 The blog argues for the use of health-informed methods using our research experience in Cali – Colombia’s third largest city – in the implementation of web-based participatory mapping tools for a project in the implementation phase. Transport is a very effective instrument for urban policy definition and delivery. As showcased by the rapidly increasing number of kms of Bus Rapid Transit (BRTs), cable-cars, cycling lanes and many such other projects built in recent years throughout Latin America, transport has claimed a central role in current urban development trajectories. For instance, out of the 170 cities that have implemented Bus Rapid Transit (BRT) systems globally, 55 (32%) are in Latin America, with 1,816 km of BRT networks built regionally (BRTDATA.ORG, 2018). Investments in mass public transport infrastructure have opened the door for urban transformations driven by transport developments via promotion of Transit-Oriented Development (TOD), reclaiming of public spaces, development of non-motorised infrastructure, and other transport-land-use integration strategies. Strategies such as the above have enabled sustainability and climate-change adaptation agendas to redefine some of the relationships between built environment and transport infrastructure across the region (1; 2). There is also larger awareness in the research and policy spheres about the health implications of transport, from a preventive medicine and physical activity perspective, to access to healthcare, environmental exposures and road safety (e.g. 3; 4; 5). The Caliveable project (www.caliveable.com) is a research initiative led by Dr Daniel Oviedo at the DPU and funded by the Lincoln Institute of Land Policy. The project involves a multi-disciplinary team of UK-based and Colombian researchers seeking to develop frameworks and methods for baseline studies of liveability and the social determinants of health of nascent transport-centred urban projects. The project argues that by building on rigorous and tested frameworks such as liveability, which are cross-cutting to both the built environment and health, it is possible to construct tailored baselines for the design, monitoring and evaluation of the effects of transport-centred interventions on the social determinants of health. The project studies Cali’s Corredor Verde (CV) as the empirical context for the development and implementation of the study. The CV is a large-scale infrastructure and public space investment programme aimed at enhancing social, economic and regional integration with a regional train at the centre of urban interventions traversing the city from north to south. The Corredor Verde project has a modern public transport system intending to serve as regional link with emerging poles of population and economic growth near Cali (e.g. Yumbo, Palmira). The corridor also intends to become an environmental anchor and axis for supporting urban biodiversity, linking interconnected biodiversity points and support structures – such as waste and recycling plans, nurseries and educational trails. 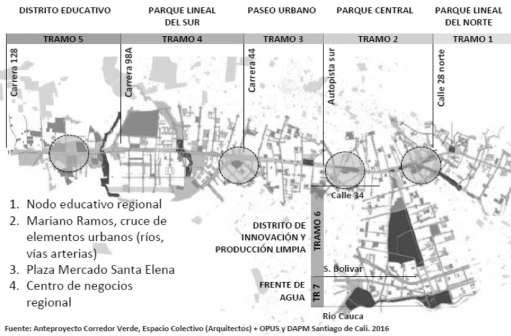 The transport dimension of the project aims to promote active travel and urban transformations based on the notions and principles of TOD, which align with the overall objective of re-unifying the eastern area of Cali with the rest of the city. However, there is no evidence on how this is consistent with the implementation of measures that promote determinants of health and liveability neither on the guidelines or the project’s masterplan. Moreover, given the socio-spatial distribution of the population, the investment rises questions regarding its distributive effects. Will the citizens from both sides of the corridor be benefited equally? Could the CV create an increase in land value and consequently ignite processes of gentrification and expulsion of low-income residents? Source: Caliveable, 2019; OPUS, DAPM and Espacio Colectivo Architecture team, 2016. We aim to examine liveability in seven domains – employment, food housing, public space, transport, walkability and social infrastructure – linked with health and wellbeing outcomes (6). Two challenges emerge when approaching a project such as the Corredor Verde from a liveability perspective: the first is lack of purpose-built data for comprehensive analysis of the different dimensions of the concept, the second is lack of resources for collecting a sufficient sample that can serve in later stages for impact evaluation. The Caliveable project addresses these challenges using web-based geo-questionnaires designed for participatory mapping. We optimised resources available to deploy targeted field data collection campaigns in areas with lower income and access to technology and neighbourhoods with high levels of illiteracy and other restrictions for self-reporting. Using Maptionnaire (www.maptionnaire.com) the team has designed a comprehensive 15-minute questionnaire dubbed The Calidoscopio, that allows building indicators based on numerical scales, Likert, multiple choice question, multiple choice grid and draw buttons. Drawbuttons are a feature of the approach of participatory GIS as it enables respondents to map out different features of their behaviour and their urban environment. The Maptionnaire platform enables the construction of geographical-based features, making it possible to crowdsource mapping for different purposes. For example, a respondent is asked to draw the area of the neighbourhood they perceive as more polluted and then evaluate how they perceive how this contributes/affects their quality of life. The graphical result allows both the interviewee and the researcher to work with a superposition of georeferenced and self-completed information layers. The platform also allows mapping routes and points in the city, which are relevant for transport-specific analysis such as accessibility and walkability. The superposition of layers of analysis through easy visualisation is one of the key advantages of the web-based tool for participatory GIS. Initial findings from the deployment of the liveability questionnaire in Maptionnaire have produced comprehensive information about behaviours, preferences, needs and perceptions, not often captured by traditional data collection methods applied in transport studies. The tool enabled the research team, even from the pilot stage, to add a spatial dimension to variables explicitly linked with the social determinants of health, informing location, distribution and characteristics of the built environment from an urban health perspective. This will inform not only planning and development of the Corredor Verde and other relevant transport infrastructure projects in Cali, as well as leaving a replicable methodology for monitoring and evaluation. The Caliveable project seeks to establish alliances with government authorities and researchers for the appropriation of the tool and scaling-up of the methodology for future health monitoring and impact assessments of the Corredor Verde. Experiences with the use of alternative methods for data collection have been introduced in the DPU’s curriculum for years. Such practice has continued in the context of our Transport Equity and Urban Mobility module of the masters in Urban Development Planning course. Students have received training in the Maptionnaire tool and have had the chance of designing and deploying a small-sample test survey in the London Bloomsbury area. 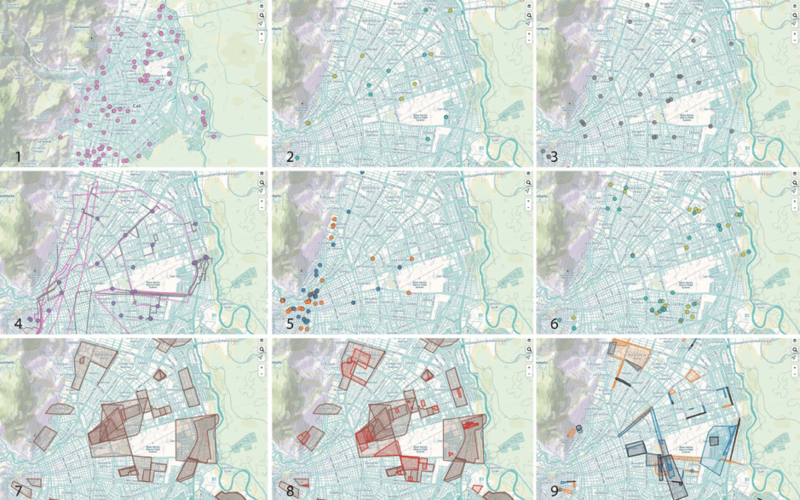 Students from across the DPU and the Bartlett have used participatory GIS questionnaires to address issues such as night-time mobilities, liveability and well-being related to transport, transport and security, and walkability. The experience with the use of innovative methods and technological tools for data collection have served for collective reflections about the role of data in leading to more inclusive and sustainable urban transport planning and the need for grounding innovative methods in rigorous conceptual frameworks and context-specific considerations as those covered during the module. The exercise also informed reflections related to research ethics, data management and privacy and the challenges of development research in the digital age. Paget-Seekins, L., & Tironi, M. (2016). The publicness of public transport: The changing nature of public transport in Latin American cities. Transport Policy, 49, 176-183. Vergel-Tovar, C. E., & Rodriguez, D. A. (2018). The ridership performance of the built environment for BRT systems: Evidence from Latin America. Journal of Transport Geography. Sarmiento, O. L., del Castillo, A. D., Triana, C. A., Acevedo, M. J., Gonzalez, S. A., & Pratt, M. (2017). Reclaiming the streets for people: Insights from Ciclovías Recreativas in Latin America. Preventive medicine, 103, S34-S40. Salvo, D., Reis, R. S., Sarmiento, O. L., & Pratt, M. (2014). Overcoming the challenges of conducting physical activity and built environment research in Latin America: IPEN Latin America. Preventive medicine, 69, S86-S92. Becerra, J. M., Reis, R. S., Frank, L. D., Ramirez-Marrero, F. A., Welle, B., Arriaga Cordero, E., … & Dill, J. (2013). Transport and health: a look at three Latin American cities. Cadernos de Saúde Pública, 29, 654-666. Badland, H., Whitzman, C., Lowe, M., Davern, M., Aye, L., Butterworth, I., … & Giles-Corti, B. (2014). Urban liveability: emerging lessons from Australia for exploring the potential for indicators to measure the social determinants of health. Social science & medicine, 111, 64-73. The cLIMA sin Riesgo research project in Lima, Peru, adopts participatory mapping as a means to gather quantitative and qualitative information to capture varying degrees of natural and man-made conditions of vulnerability that affect women and men living in the center and in the periphery of the city. The process is designed to open up dialogue between various stakeholders, with the aim of informing the design of interventions that prevent and reduce risks. To better understand the everyday risks that inhabitants of the two case study sites are exposed to, we spatialise our inquiry capturing how these risks are distributed and where they accumulate in space (Figure 1). This is a necessary step in identifying how, and where, risk traps need to be disrupted. Preliminary findings suggest that actions taken in one place to mitigate risk may, in effect, externalise the risk to other locations. Hence mapping to make visible the interdependencies that constitute and shape a given territory becomes a vital step in our enquiry, particularly as we seek to devise solutions for an integrated, and co-produced planning. This notion of interdependencies materialise at different scales in both Barrios Altos (BA) and José Carlos Mariátegui (JCM). Therefore the analysis is undertaken at various scales. In BA, some of the quintas (multi familiar residential plots) that have private ownership, also present a weakened social organisation. The quinta, which used to function as an identifiable unit, with common areas and the shared goal amongst residents to improve these areas collectively, now works as a group of individual structures. The impact of such changes is noted as some households undertake improvement works and in doing so, move away from the traditional one storey structure made of adobe, replacing it with multi-storey brick and concrete buildings. As the structural integrity of the buildings are weakened due to the disparate materials used, the residents are differentially exposed to risk. Besides the increased physical risks that such practices bring, the weakened collective action and organisation also increases the vulnerability of residents to land trafficking activities. Moving out of the quinta and analysing the scale of the manzana (block), it is possible to capture the increasing threats which are claiming the Historic Centre. Land speculation is leading to the slow eviction of many vulnerable tenants. Moreover, the cancerous growth of storage facilities, also increases the likelihood of fires with the storage of highly flammable materials. If a quinta is adjacent to any of these conditions, it is also more vulnerable, as different land use types interact to increase risk. In JCM, the interdependencies materialise on the slope. Risk is unevenly distributed with those higher up the slope having to pay more to mitigate risk and make the area habitable. However the occupation in the higher parts, as well as the opening up of roads by large scale land traffickers to capitalise in this area, also increases risk for the lower parts e.g rock falls etc. The latter also have to invest to cope with this risk. Hence mapping at the scale of settlements can make visible where risk mitigation strategies are taken and where risk is externalised to. Having analysed how risk is mapped by various institutions in Lima, the project acknowledges the need to work at a finer scale. Many of the official maps homogenise risk painting large areas in red, whilst a more grainier and differentiated understanding of everyday risk is sought in this project. For this purpose, the base maps used also need to be at a level which show subdivisions in built structures. As the Cadastral Institute of Lima only provides the information at manzana or plot level, the SEDAPAL maps are hereby used as a base because they show water connection in every household and thus capture subdivisions. Furthermore, in the process of data collection, high resolution drone images for each area are used in a process of manual mapping (Figure 1) undertaken in parallel to digital mapping using EpiCollect+, a free application on smartphones which enables the digitalisation of surveys as these are collected. Departing from the need to map everyday risks at various scales, the project will undertake geo-referenced surveys in both areas at: 1) the household level, to assess the individual investments made to mitigate risk; and 2) at the quinta level in BA and the settlement level in JCM, to assess the collective investments. 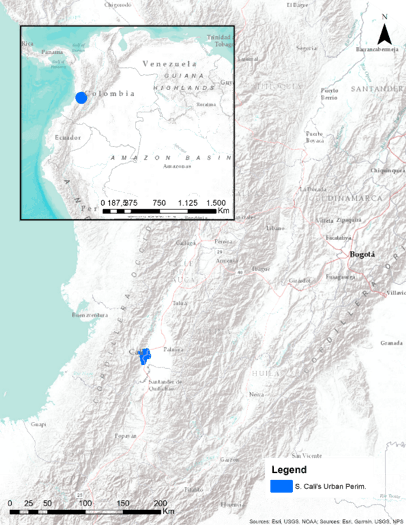 The data collection takes a significant representative number: in BA, 30% of quintas in a manzana (40 manzanas in total are chosen, representing half of BA area) and in JCM, 30% of occupied plots for each of the 11 settlements under study. The participatory nature of the process involves capacity building in mapping, the integration of residents in data collection, and the co-design of the survey to include information that inhabitants deem important to them. This means that the method is also used to strengthen existing processes of change, particularly supporting social mobilisation and integrated planning. In BA, community leaders, accompany the fieldwork, sharing information and communicating with others in their neighborhood. This is a necessary step to promote collective action and resist unwanted changes. In JCM, on the other hand, identifying the various investments made over time in each settlement, and making visible the increased investments that need to be made to continue this form of urbanisation raises consciousness of the ripple effect created by atomised actions upon the territory. This paves the way for an integrated planning between settlements but also more coordinated actions between inhabitants and state agencies. Rita Lambert is a teaching fellow at the Development Planning Unit, UCL, where she is primarily engaged in the planning and delivery of the practice module of the MSc in Environment and Sustainable Development. Originally from Ethiopia, she undertook her university studies in Edinburgh and London. She graduated from the Architectural Association in London, where she later taught for 4 years in the final years of the Diploma in Architecture. In 2009, she studied in the MSc in Environment and Sustainable Development, at the Development Planning Unit , UCL. 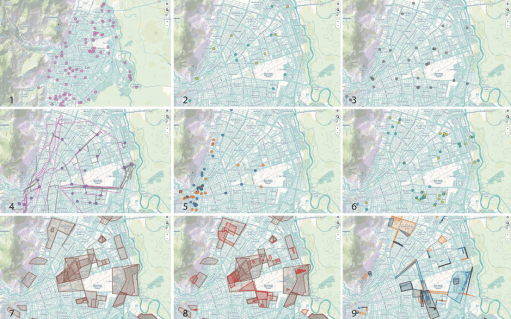 Her particular interest lies in mapping, as a tool which can be adopted by ordinary citizens to navigate institutional barriers and expand the room for manoeuvre towards environmentally just urbanisation. This post and the project exploring place in Kilburn has been undertaken in collaboration with Kamna Patel. In the old days school level students saw universities as the most mysterious of places – where and what were they, what do they teach and how? They were rarely told anything much in answer – except that it was a very good idea to try and get in. But how did people know where to apply, and what subjects to choose? Little guidance was available. Today, much has changed. It’s common for prospective university undergraduates, to attend ‘open days’ available throughout the year from all and sundry higher education establishments. At them, potential applicants can hear from academic staff what to expect if they go university, and learn briefly what different subjects have to offer. All very useful, but now, academics from Development Planing Unit in University College London are going one step further. We are offering some school students the chance to become undergrads for a time and join us in a research project exploring urban citizenship and place-making. First, the workshops explored the students’ own perception of Kilburn, where they live – what is it like for them, and how much have they noticed recent changes in the area. And they explored how the changes going on reflect the broader processes of globalisation that we are constantly hearing about (e.g. big new developments funded by foreign capital, soaring house prices fuelled by demand from people wanting to work in London, changing ethnic mixes, and so forth). Then the students used techniques from the social sciences to analyse different portrayals, or ‘representations’ of Kilburn, coming from diverse sources such as websites, films, written texts in books, magazines, music, social media and so on. Besides these workshops, the students conducted fieldwork in the area. There, intriguingly, they made maps of how people, including themselves, feel about different parts of Kilburn – identifying, for example, ‘spaces of fear’ where it might be dangerous to go at particular times of day or places where they feel more at home. In such exercises they applied different research methods (such as transects walks through their neighbourhood) as used by social scientists and Town Planners amongst others. In all this, the students were getting much more than just an ‘open day’ afternoon. Theirs was an in-depth experience, sustained over time, of the kinds of things they might expect to be doing at university, including an up to date view of the sorts of research methods and analysis that planners and geographers might apply in their work. And here, the St Augustine’s students were actually sharing in such work. The workshops and fieldwork ran over several months, culminating in the students producing their own representations of Kilburn shown at a roving expedition running throughout 2015 – at UCL, at St Augustine’s and at the Tricycle Theatre in Kilburn. The exhibition’s centrepiece is a series of 3D maps of Kilburn produced by the students themselves. These are not a ‘conventional’, accurate-to-scale representations. Instead they incorporate their different perceptions of, and concerns and aspirations for this busy, dynamic and multi-faceted place. The exhibition opened in January 2015, and at that opening visitors were guided through by some of the students themselves, explaining the maps and models, and recounting how they were produced. They also had to explain to the audience the practical usefulness of such cultural geography work, in developing peoples’ sensitivity to place and encouraging them to think about how they can help to shape places for themselves and help to give them meaning. The latter was one of our main aims of the project. In our on going action research on this project we plan to reflect upon the extent to which the participating students, through their involvement, were provided with a sense of how they themselves might be able to shape their own urban environment and ask whether this contributed to a nascent sense of citizenship. The project is impressive – partly because of the impression which the students make on the visitors as they are guided round. Here is a group of enthusiastic, smart and articulate young people, with a dynamism that will undoubtedly make them an asset to whatever university they eventually choose if they seek to continue their studies. And hopefully they will have a flying start through their experience of doing some university level work with the academics who will teach them. Liza Griffin is a Lecturer and Co-Director of the MSc Environment and Sustainable Development at the DPU. Kamna Patel is a Lecturer and Co-Director of the MSc Development Administration and Planning. Both have lived in the Kilburn area.